From the creator of one of the 1990s’ best ’zines, a debut memoir chronicling his mission to wash dishes in each of the 50 states. A San Francisco kid who spent his youth getting in trouble with cops, the author found that he liked wandering around the country much better than attending college or maintaining any sort of steady work. 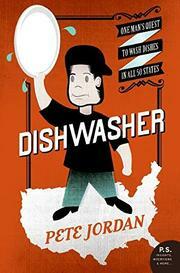 Dishwashing, he discovered, was the holy grail of itinerant employment. Being a “suds buster,” as Jordan memorably dubs it, isn’t exactly high in prestige—he quotes an opinion survey that ranked dishwashing #735 in status out of 740 jobs—but there are always openings and few expectations, since most dishwashers last no more than a few weeks at a time. The profession’s traditions include “laziness, drunkenness and ditching jobs without even a minute’s notice”—and you have to quit, since it’s basically impossible to get fired. Jordan was in Alaska when he got the notion to wash dishes nationwide and create “a little dishwashing publication” as well; a knowledgeable subs-busting buddy explained what a ’zine was and handed him a copy of Down and Out in Paris and London. Inspired by Orwell’s memorable delineation of the plongeur ethos, Jordan photocopied Dishwasher #1 in Arizona, put out a second issue in Texas and managed to squeeze out 13 more over a dozen years of hitchhiking, bumming rides from friends, crashing on people’s couches and getting dumped by girlfriends. (A postscript tells those who ordered #16 to get in touch, and he’ll make good.) Among his most challenging gigs: an isolated post on an oil rig and an attempt to disprove the received wisdom that a white guy couldn’t get hired in New Orleans, where all the suds busters were black or Mexican. Enjoyable manifesto celebrating rootless irresponsibility, with rueful acknowledgement of the pitfalls therein.